Hello and welcome to exampundit. 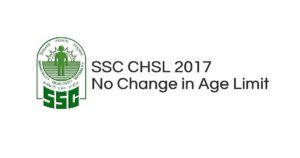 Today SSC has clarified on the SSC CHSL 2017 Age limit criteria in their notification. After a lot of grievances SSC has finally gave a notice that they will NOT change date of qualification and age in the SSC CHSL 2017. Attention of aspirants of CHSLE, 2017 is invited to the instructions of the Government (DoP&T) contained in OM No. 14017/70/87-Estt. (RR) dated 14.7.1988 wherein guidelines for fixing the crucial date for determining the Age limit for Competitive Examinations held by Staff Selection Commission have been given. The Commission in strict conformity with the said instructions/ provisions has fixed the crucial date for reckoning of age as on 01.08.2018 in the Notice of CHSLE 2017. It is further made explicitly clear that the crucial date for reckoning of age and Educational Qualification for CHSLE, 2017 would be 01.08.2018 and no change in this date would be made.